Balance, balance, balance! It’s the mantra of almost every mama out there, and if there’s anything more intense than staying home and raising little ones, it’s finding time in our day to do things like make money. As moms, we don many hats at any given second. We wipe noses, wipe tears, apply Band-Aids, teach letters, and change batteries – all while keeping one hand on the diaper to avoid getting peed on. We’re masters at multi-tasking, and we certainly don’t give ourselves enough pats on the back for all that we do. I’m right with you. Not so long ago, I was thinking the same thing: I need money, but how do I possibly find the time in between temper tantrums, fluctuating nap schedules, cleaning, and spending quality play time with my littles to make any money? 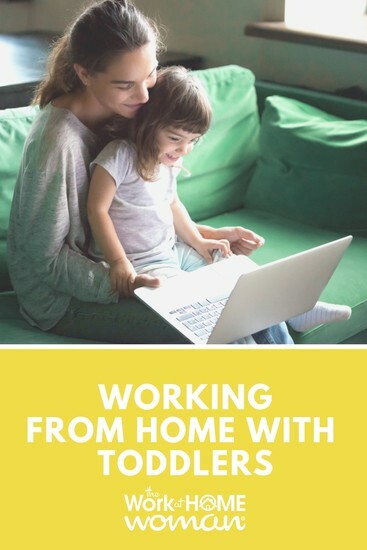 While we might not be able to keep your toddler napping, we certainly found the answer for how you can make money and work-at-home with your toddlers in tow! Below you’ll find some of the best ways to make money from home all while balancing a toddler on your hip. In the blur of playing, reading, learning, and everything in between, days and weeks seem to fly by in a flash. While we can’t slow the passage of time, we can manage it a little better. Before I discovered block scheduling, I couldn’t tell you how 8:00 a.m. suddenly turned into 8:00 p.m. My discovery of block scheduling was nothing short of a miracle and is now one of my secrets to success. If you’re like me and tend to spend hours on any one given activity, (or bounce from activity to activity with half projects looming around the house), block scheduling might be your ticket to grabbing that much needed time back into your day! In its most simplistic form, block scheduling allows you to section off blocks of time for specific tasks every day. How I arrange my schedule will probably look different from your daily schedule, but here’s an example of my upcoming Monday complete with blocks of time for some of my tasks. If you notice, I use a pattern in my schedule that goes something like: “an hour to play, an hour to work” back and forth throughout the day. Of course, this doesn’t consider any unforeseen interruptions or “bumps and bruises” in my day which almost always thwart my schedule. I’ve found that it’s better for me to lay out a potential plan, and then keep in mind that it’s just a “plan.” That way, I’m not adding stress if something doesn’t go exactly the way I planned. This schedule has also become a kind of “journal” for me to remember what I’ve done with my kiddos during the day (every day seems to blend into the next with toddlers). Planning out an entire day or a good portion of it is not necessarily for everyone. Perhaps carving out a small part of your day to earn money is where you’d like to start. If you have toddlers, naptime might be the right time to start earning some money. Start taking advantage of this oh-so-sacred point in your day and start a job that will fit into their nap schedule. Believe it or not, some of the opportunities we have listed below are perfect for mamas with napping toddlers, as the tasks are short and won’t eat up too much of that precious quiet time you have for yourself. Another advantage of these sites is that you can return to them later and complete more tasks when your toddlers are sound asleep for the night! Here are a couple the websites that I’ve found helpful for those days where I have less than an hour to spare. Copify: A copywriting service that posts writing jobs throughout the day. Pay varies, depending on the project. Respondent: Complete surveys in your spare time! Payments vary depending on the survey. Figure Eight: Complete short tasks like internet research and data collection. InboxDollars: InboxDollars is another online survey site that pays cash for surveys completed. Most surveys take between 5-30 minutes to complete. If your toddler doesn’t nap or decides that today is the day that a 15-minute “power nap” is all that’s needed, how do you possibly find time to make money? Below are a couple of ways to help your toddler get in some play time while you make a few extra bucks on the side. In our house, we keep plastic tubs that contain a variety of assorted items – from a bin of rice with letters in it for a letter hunt to crafting boxes filled with glue, scissors, glitter, and crayons. Creating a fun box where your toddler can sit on the kitchen floor and dive in while you write, make a call, or complete a survey for cash, is an excellent way to sneak in some time and allow your toddler to use their imagination to play! Here are some ideas for “fun” boxes by theme. You can come up with a variety of bins, put them out on your kitchen floor, and let your toddler get busy. Not only will this encourage independent play, but it will free up some time to earn a little money! This may sound counterproductive, but if your town has a public library filled with toys, games, and other kiddos, it could be a home run. I often meet up with a few other mom friends who have kiddos, and everyone sits and plays. I’m able to hop onto my phone, complete a survey, or apply for a job while my kiddos play. It’s a win-win! While we’re all balancing similar responsibilities day-to-day, we’re still all different. The jobs that you find easy to mesh into your day, I may say “no way” to and that’s alright! You may find that freelance writing is too much to handle (who can type with one hand anyway? ), but something like selling old baby clothes and toys could be simple to work into your day. Here are a few stellar money-making ideas you can implement into your everyday schedule. Online marketplaces are huge! People use those spaces to find items (like yours) every day. Besides their popularity, many of these online marketplaces have apps that are quick and easy to use. Simply snap a picture, add a description, and post! Here are a few of our favorite online spots where you can drop in to post some of those items you’d like to sell. If the online marketplace isn’t quite your thing or if you want more opportunities to sell your items, check out brick and mortar consignment stores and Facebook community pages. The more exposure your items get, the faster you’re likely to sell them and earn some money! These short tasks are perfect for those days when you have about 10 minutes in between the hustle and bustle of toddlerhood. Here are some great sites to get you started. The length of time you’ll need to complete copywriting work will depend on the type of writer you are (some people can develop ideas quickly while others require a little more time), the projects, and the deadlines. Some of the projects I’ve taken on had deadlines that were three or four days out, so I was able to write over the course of those days and in-between naptimes. Here are a few sites we love for copyrighting opportunities. If you’re looking for even more ways to earn money with your toddlers in tow, here are some other sites to check out. 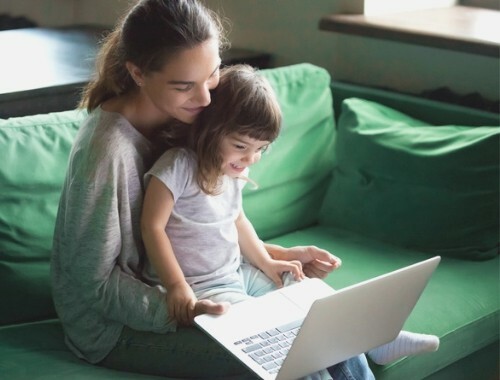 With so many work-at-home opportunities, the options are endless when it comes to finding the right job that fits you and your toddler’s schedule. Surveys, writing opportunities, and sales are all options depending on how your day looks. One way to ensure success is by starting small and building up your workload from there! Add money to your pocket, not stress to your day by being realistic about what you can take on in your day-to-day routine. With these opportunities, you’ll be pleasantly surprised at how easy it can be to balance earning some money while playing with your toddlers. We would love to hear from you! Do you have a work-at-home experience you would like to share? Advice for others balancing toddlers and making money? Drop us a question or comment in the box below!